We’ve already exceeded our original 2018 goal of $500,000 and we’re not slowing down! For over 130 years, Avon has inspired the financial independence, health, and wellbeing of women and their families. Our commitment in the fight against breast cancer is central to this mission, and we are proud of the impact we have made since the launch of the Avon Breast Cancer Crusade in 1992. Together with our Avon Representatives, customers and employees, we have impacted millions of women and contributed over $800 million to breast cancer causes. And, there is more work to be done. That's why we are joining forces with the world's leader in the fight against breast cancer - the American Cancer Society Making Strides Against Breast Cancer program. Making Strides Against Breast Cancer unites us to walk together - over one million strong in 200 communities across the nation - as the most powerful force to end breast cancer. Making Strides walkers turn awareness into action by raising more than $60 million for the American Cancer Society each year - one dollar at a time - to save lives from breast cancer. You can be proud that your efforts are helping more than 3.5 million breast cancer survivors living in the US. 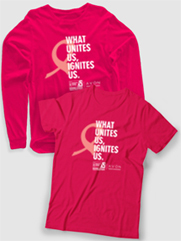 The money you raise helps the American Cancer Society do the most for people with breast cancer today, to end the disease tomorrow. Together, Team Avon and the American Cancer Society will raise money and awareness, and impact even more lives in the fight against breast cancer! We've created a toolkit with helpful tips to get you started on growing your team and kick-starting your fundraising. *If you are joining the Making Strides of Atlanta walk, please enter the discount code "MSABC20" during registration to waive the registration fee."